One of the biggest changes I have seen since moving over to my new office is that the number of scale models has gone up considerably. There are currently 7 fairly large models stashed all over the office and despite the fact that the staff is almost sitting on top of one another, we are okay taking up precious real estate because we think these models send the right sort of message and help set the tone for the type of design culture we want to maintain in the office. The college fall semester is now underway and we lost 3 of our heavy model hitters – aka, the “Summer Interns”. 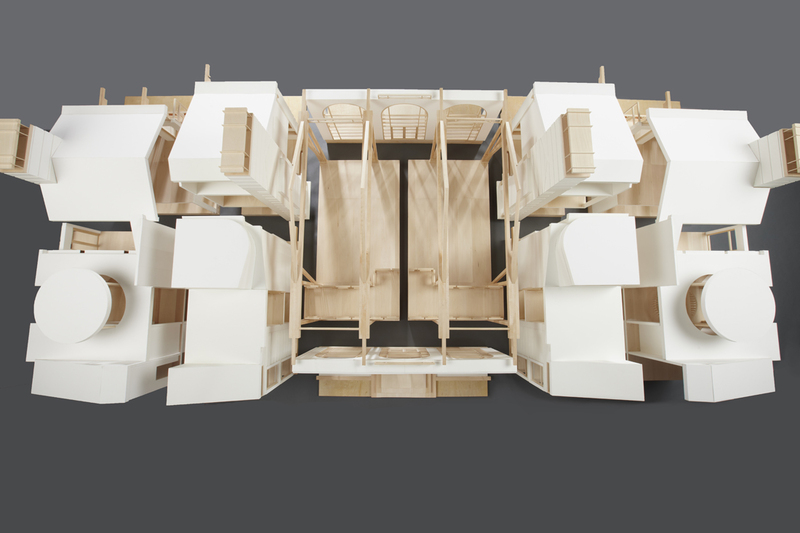 For the last few months, we have had three talented and extremely capable young architects in training – Ellie Hopen [Carnegie Mellon], John Charbonneau [Texas Tech], and Travis Schneider [UT Austin] all working full-time to build models and prepare the graphics for our recent Architectural Project Book. One thing we really work on is trying to get our interns working on something that has value, things that contribute to the office in a positive manner, and something that has value to them when they return to school. We’re lucky in the we get to cherry pick some of the best college interns looking for summer work and when they leave, we typically want them to return. That means their time here needs to be well spent and having work for them to do that creates ownership is important. Two of our interns – John and Travis – spent a bulk of their time this summer working on a single model – the “Voltron” of models. I took all the pictures in this post except for the last 4 (which should be exceedingly apparent to you) at the very end of the model building process. Unfortunately, interns Ellie and John had already left for college and don’t show up in these photos. The model that I thought I would show today is for a residential project we currently have in development. The picture above just starts to hint at its size – the scale for this model is 1″ = 1′-0″ which is without any questions the largest scale model we have ever built. I should also point out that this model is actually 12 individual models that can be taken apart for closer inspection. Did I mention that this is only a portion of the house? This is the front 1/3 of the house – the portion that faces the front yard and main street. We did not include the basement or the two wings that make up the other 2/3’s of the entire project – which is probably a good thing because I don’t know where they would have gone. This model took up the better part of this part of the studio and I can speak from personal experience that it was slightly nerve-wracking to have to shimmy in the 15″ between the model and the wall in order to get into the back part of the studio. One too many burritos and you could imagine falling (in slow motion of course) on top of the model. If the model didn’t disable you during the fall, I’m quite sure the interns would finish the job. Once the model was completed, (i.e. summer ended and the interns went back to school) we thought it would be a good idea to document the finished product. Most models in our office could be shot in-house with the tiniest amount of effort. Since this model in its fully assembled state measured 12″-6″ by 6′-0″, we needed some help. We have a lot of photographers that are friends of the firm and we found one who was willing and able to accommodate the size of our model. Jonas Ramos with Paul Morgan Photography was happy to spend the afternoon helping us move models around and build a platform large enough to accommodate this model. This is one of our associates – Peter Joe – carrying in one of the individual model pieces … it helps to set the scale of the overall total model. Since Travis was still around, he was responsible for assembling the model components together and adjusting the spacing between the individual models. This distorted picture was taken with my iPhone camera with the “panorama” setting … there was a lot of sitting around waiting on “stuff” to happen so I entertained myself with my phone. A screen shot of the software photographer Jonas Ramos was using to check light levels. It’s called Capture One Pro 7 and is incredibly slick. This seems to be the software of choice for most of the architectural photographers I know – if I took more pictures I could probably be convinced that I needed to buy my own copy. “Why did the model have to be so large? In other words, we wanted to stick our heads in it to get a better sense of the scale. It’s not that often that you design a Living Room that’s approximately 2,400 square feet all by itself. One of the things that wouldn’t be readily apparent is that we were developing this model concurrently as we were developing the design on the house. To say the finished model doesn’t reflect the current stage of design isn’t necessarily fair, but it isn’t incorrect either. 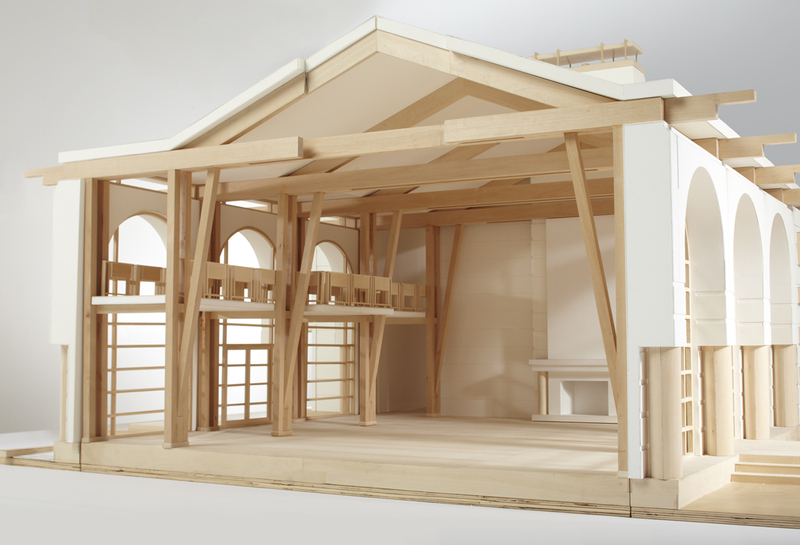 A vast majority of the models we make are not made to serve as a testament to the final design – these are working models and as such, rarely reflect the final design. These models, besides playing a role in setting the tone for the culture of the office, help us work through the form, space and scale of the projects. The fact that they look cool is simply an awesome by-product.